Do Endoline machines come in stainless steel finish as well as mild steel? Yes, with most Endoline machines you have the choice of mild steel or stainless finish – you can state your preference when you order. Is Endoline equipment made in the UK? Yes, all Endoline system range machines are manufactured at our factory in Biggleswade, Bedfordshire. All Endoline machines come with a 2 year comprehensive warranty on materials and workmanship. Components are guaranteed for 1 year. All warranties include parts and labour. The manufacturer’s service routine must be adhered to for the warranty to remain valid. What is the availability of a demonstration machine or a reference site to visit? Endoline will always endeavour to arrange a demonstration for you, either at the factory or on-site with another customer. This can be discussed and arranged with your sales contact. How easy is it to adjust a case erector from one case size setting to the next? All Endoline case erectors are designed to be simple to operate with quick and easy case size change. The controls are simple and operator friendly and full training will be given at the time of installation. It typically takes between one and five minutes for a full size change. Are your case erecting machines simple to operate? Yes, all Endoline case erectors have a very simple control panel. The machines are designed to be operator friendly with clear access for cleaning and maintenance and to minimise machine down time. They can even be supplied with multi language controls. What is meant by handing on a case erector, i.e. left to right or right to left? This is the direction in which the cases go through the machine. It also affects the print on the case therefore please check with us when placing your order. Can Endoline case erectors handle cases of variable quality? Yes, this is a specific area of strength due to the features included in all Endoline case erecting machines. Can Endoline case erectors handle type 0201, or American style cases? This is the standard capability of all our case erectors, plus others can also be handled. What speeds can be achieved with Endoline case erectors? Depending on the model you require, speeds of between 10 and 30 cases per minute can be achieved. How big are the cases erecting machines (footprint)? Endoline’s case erectors are designed to have a compact footprint and will not take up a great deal of space in your production area. Each model varies in size and actual sizes can be provided for individual machines by your sales contact or by viewing the appropriate product leaflet on the website. How easy is it to load the hoppers on a case erector? What is dual opposing vacuum case opening? This unique design feature means that each case is opened positively from both sides. It ensures the efficient and reliable opening of cases and overcomes problems that can be associated with stiff board and glue migration from the manufacturer’s joint. Can Endoline case erectors deal with specialist cases for shelf-ready? Yes, in many situations we can handle cut-outs and perforations as well as non-standard flap designs. What is a semi-automatic case erector? Endoline’s semi-automatic case erecting machines are designed to reduce the time and effort taken to manually erect a case, at a low capital cost. The machines fold the lower flaps and hold the open case steady to allow packing to take place with both hands. What is the machine footprint of an Endoline case sealer? Endoline’s case sealers are designed to have a compact footprint so as not take up a great deal of space in your production area. Each model varies in size and actual sizes can be provided for individual machines by your sales contact or by viewing the appropriate product leaflet on the website. Can Endoline supply the tape, and if yes what sizes and colours are available? Yes, Endoline can supply tape in all sizes and colours – 38mm, 48mm and 75mm widths. How quick/simple is it to change from one case size to the next? 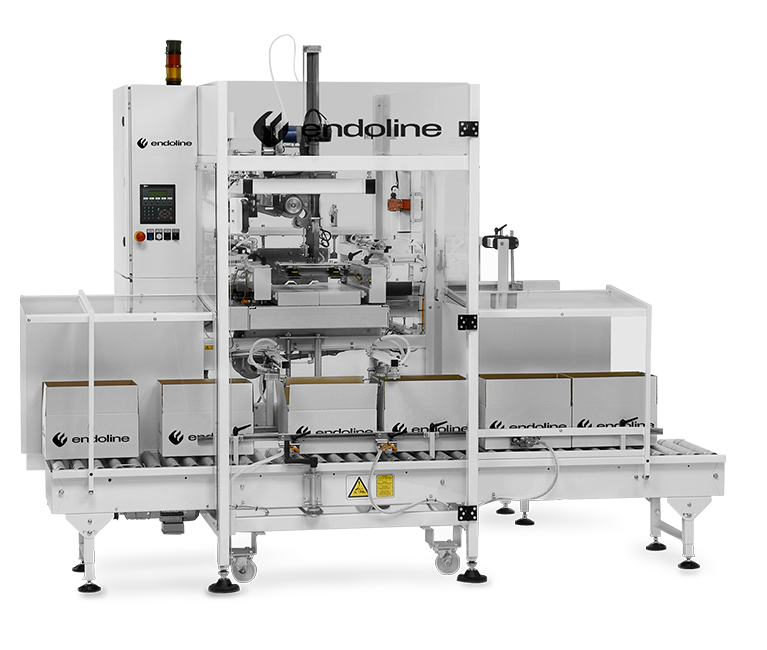 Endoline produce a series of automatic and semi-automatic random case sealers that can automatically adjust to variable case sizes, some with and some without an operator. Other pre-set machines are designed for quick and easy manual. Can Endoline machines handle shelf-ready cases? What is the maximum throughput speed that can be achieved with Endoline case sealers? Depending on the case size, some Endoline machines can seal cases at up to 25 cases per minute. What is the maximum picks per minute speed? 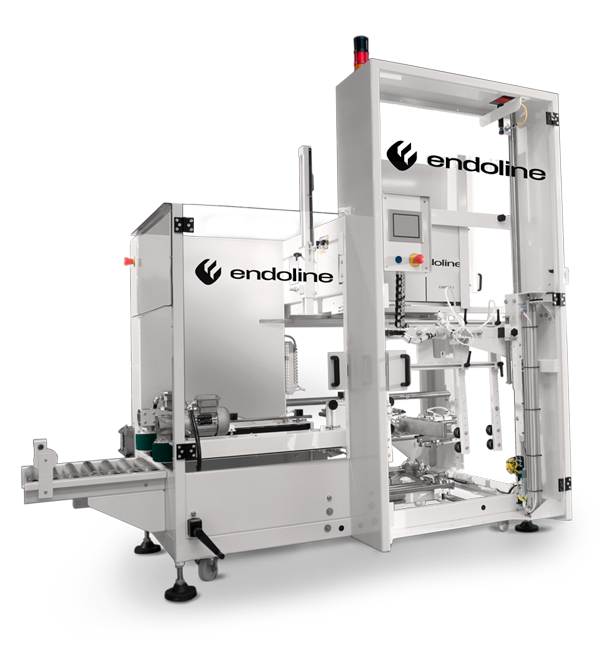 Endoline’s pick and place machines can achieve 15-20 picks per minute, depending on the product. What is the maximum weight it can pick up per cycle? Endoline’s pick and place machines can pick a maximum weight of 15kg per cycle. What type of conveyors can Endoline supply? Endoline can offer you a wide range of conveyors for all packaging and end of line requirements. Our firm belief is that packaging machines can only operate efficiently if the conveyors feeding to and from them compliment them in terms of speed and control. For example, Endoline can supply slat belt, modular belt, powered roller, gravity roller and gravity skatewheel conveyors. What is the benefit of a packing station? Packing stations are ergonomically designed to reduce the effort required to hand pack a wide variety of products by ensuring that products, people and packaging are arranged in the most efficient way possible. 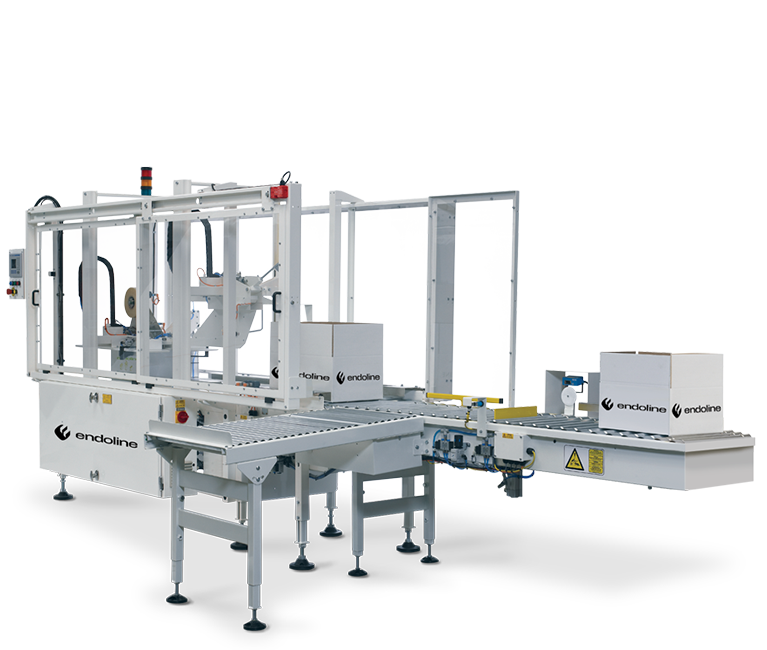 Investing in a hand packing station can provide significant short-term savings and future developments can be accommodated as each system can be upgraded by integrating with any Endoline erecting, forming or sealing machines. What service and after sales support do Endoline offer? Endoline recognises the importance of offering comprehensive support to its customers throughout the lifetime of its machines. From the initial installation and training through to servicing, quality spare parts and help and advice available whenever you need it. How easy is it to get hold of the right spare parts for Endoline machinery? Endoline holds hundreds of guaranteed stock items with full manufacturer’s warranty and next day delivery (when ordered by 1pm). If we don’t hold the part in stock we will get hold of it for you as quickly as possible. You can order by phone or online. How soon will I receive my spare part? If ordering a stock item you will receive your part the next day (as long as you order before 1pm). Other non-stock items will normally be delivered in 3 to 7 working days. What servicing is required and how often? Endoline recommends that consumable parts are replaced on a regular basis, for equipment that runs 8 hrs a day 5 days a week that would be every 6 months. Machines with longer hours of operation will require more frequent attention and our service department will be happy to give advice. What service options are available? Endoline can provide maintenance contracts to cover most needs from consumables replacement to full maintenance and servicing support with or without emergency breakdown cover and to include spare replacement parts. We can provide “custom” contracts to cater for your specific needs, just tell us what you want! I need a spare part but I don’t know the part number? Just tell us the machine type and serial number with a description of the part, alternatively e-mail us a photo of the part you need. How soon can someone come to fix a problem? Endoline’s Service Department aims to have a fully trained service engineer on site with you within 24 hours in case of machine breakdown. Outside the UK we aim to provide a service within 72 hours. We have a comprehensive support team to help with any enquiry. If you are unable to find your answer in the FAQ’s please call on one of the numbers below. We have a comprehensive support team to help with any enquiry. If you are unable to find your answer in the FAQ’s please send us a message and we will reply as soon as possible. Please tick box if you would like to receive marketing communication from Endoline. Endoline specialise in the design, manufacture and installation of high quality end of line packaging machinery. For over 30 years Endoline’s business has developed from designing and manufacturing small case taping machines to its position today as a leading UK manufacturer and worldwide supplier of end-of-line packaging machines and systems.